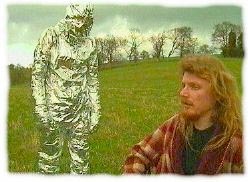 Foiled Productions are a group of independent filmmakers based in the UK. They began in 1995, when founder members Henry Burrows and Howell Parry got talking in the pub and decided that they wanted to make a movie. Not just a 10-minute short, like everyone else at the time seemed to be making, but a full feature-length movie. That idea eventually became Foiled, the cult classic "aliens vs students" B-movie set in Manchester. It might have taken over 4 years of their spare time to make, but they were not to be discouraged. Teaming up with their friend Adam Lopez, they then set out to make a sequel to Foiled's film-within-a-film "Saturday Night Zombies", called (naturally) Sunday Night Zombies. This was followed soon after by The Jedi Who Loved Me, a Star Wars fan-film made to celebrate Adam's forthcoming marriage. The film premiered at the wedding reception, and went on to play in festivals throughout the world, where it received many positive reviews. 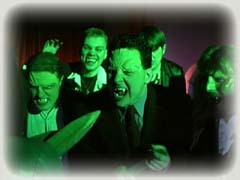 Their next movie - Fluffy The English Vampire Slayer - was the first ever fan-film (to their knowledge) to be based on the hit TV show "Buffy The Vampire Slayer". As well as releasing this movie for free download from the internet, they also produced a special Video CD release including a cast and crew commentary track, out-takes, behind-the-scenes footage, trailers, a look at some of the original auditions, and even that most coveted of extra features, an animated menu!! These are some of the key people who have been involved in Foiled Productions over the years. Click on a name to find out more about that person. OZ2ROTT = Australia 2002 - Rottnest Island; BC = Big Chimp; CH = Chirophobia; DC = Diet Coke; DH = Dr Hall; FTEVS = Fluffy The English Vampire Slayer; F = Foiled; PM = Pool Monster; SNZ = Sunday Night Zombies; TATCTD = The Alien That Came To Dinner; TJWLM = The Jedi Who Loved Me; PP = The Palindrome Paradox; DS = The Sinister Dr Stone; TT = The Tree; UFO = UFO Spotters; COPS = Undercover 70s Cops; WIU = What Is Up?